Manoj, an architect of high-volume hiring technology and practices, has spent the last two decades helping companies like Sodexo boost the performance of their talent acquisition process. Attendees will get a peek inside how Sodexo uses technology to reduce the stress of sorting through volumes of résumés by improving prescreening, response time, candidate engagement, and compliance. 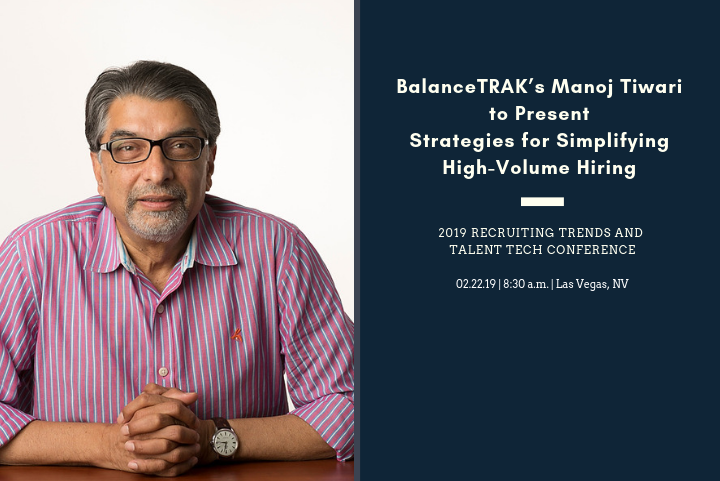 If you plan to attend Recruiting Trends and Talent Tech Live be sure to add this session to your conference schedule. Manoj Tiwari, Vice President of Product Development at Berkshire Associates Inc. where he oversees Software Development, Technical Support, and enterprise software accounts for Berkshire. With over 30 years of combined business and technical experience, Manoj has been instrumental in constructing well-defined processes and automating large-volume, affirmative action plan preparation for Fortune 500 companies. He has emerged as one of the industry’s leading authorities on engineering automated solutions for human resources. Anthony Scarpino is a Senior Director of Talent Acquisition at Sodexo, a world leader in Quality of Life serving more than 15 million consumers at 13,000 client sites in North America. As an active talent acquisition practitioner, Anthony brings real-life experience to the table. At Sodexo, Anthony’s primary focus has been on sourcing, attracting, and recruiting top talent for the organization. He takes a hands-on approach when ensuring Sodexo’s employment brand is indicative of an organization’s culture and beliefs. The Sodexo brand has been recognized as best in class by the Corporate Executive Board, Human Capital Institute, and Society for New Communications Research, and has been featured in the Wall Street Journal and Forbes magazines. Since the collaboration of Recruiting Trends and Talent Acquisition Tech Conference in 2017, the conference, Recruiting Trends and Talent Tech Live Conference has offered attendees a one-of-a-kind experience focused on both the art and science of talent acquisition with a comprehensive program that teaches attendees how to be competitive in today’s candidate-driven talent market. With insight from world-renowned talent acquisition experts and leaders, active learning, inspiring networking opportunities, engaging team-building activities, and groundbreaking talent acquisition technology, attendees leave armed with the latest trends in strategic recruiting, talent acquisition/retention approaches, and a bold vision of how technology will transform the way talent is sourced, hired, and brought into your organization.